In future, surgeons could mend damaged bone and cartilage with the stroke of a BioPen and reduce the need for joint replacements. The BioPen is a handheld 3D printer designed to allow surgeons to ‘draw’ new cells onto injuries with stem cell ink. The technology is developed by researchers at University of Wollongong (UOW) and St Vincent’s Hospital in Melbourne. The research team was recently awarded a $1 million grant from the Federal Government’s $35 million BioMedTech Horizons program. According to the funding announcement on the program’s website, this funding will enable the project to make progress on a prototype device, methodologies and bio-ink formulations that will bring the technology closer to commercialisation. Professor Gordon Wallace, director of UOW’s ARC Centre of Excellence for Electromaterials Science, said the BioPen represents the convergence of engineering, science and medicine. “The BioMedTech Horizons grant will enable the partnership between Australian academia, healthcare and industry to lead and translate our research discoveries at the coal face of care,” he said. The BioPen uses live stem cells (that have previously been extracted from the patient’s body) to accelerate the healing and regeneration of new bone and cartilage. The cells are protected by a biopolymer, with an additional gel layer. The BioPen head combines these two layers to allow the surgeon to draw a 3D scaffold on the injured bone. The BioPen incorporates a low-powered ultraviolet light source that solidifies the ink to keep the embedded cells safe. Once implanted, the cells multiply and transform into bone, muscle and nerve cells to repair the injury. A pen needs ink, and PhD student Yashaswini Vegi from Swinburne University is working on novel stem-cell technology that will provide the sizeable amount needed for the BioPen to operate as a commercial therapy. 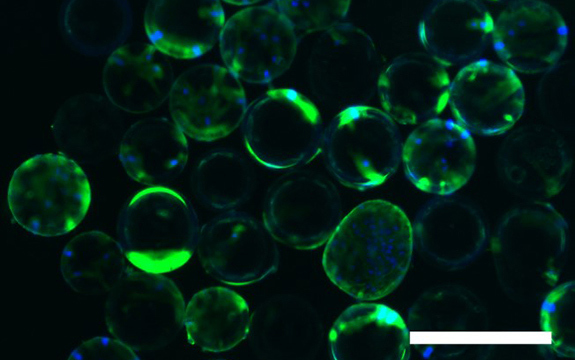 Known as BioSphere, this technology will use thousands of small polymer beads (under 0.1mm in diameter) to grow stem cells extracted from the patient. “This will vastly increase the available area for the cells to grow on, enabling researchers to generate many more cells than is currently possible,” explained Vegi’s research supervisor, Dr Nicholas Reynolds. The BioSphere technology will also solve another issue that hinders large-scale stem cell production: the difficulty of recovering them from growing dishes without damage. According to Reynolds, the surface of the beads will be coated with light-sensitive nanoparticles that can be activated with an infrared beam to cause the cells to detach safely. The stem cells will then be re-implanted using the BioPen. “In the near future it will be possible to use a patient’s own stem cells to quickly and successfully repair damaged cartilage and bone,” said Reynolds.